 Egusi soup, always tasty, thickened with crushed melon seeds and served here with chicken. Peanut butter sauce (or peanut soup) with beef. Tomato sauce with chicken and beef. 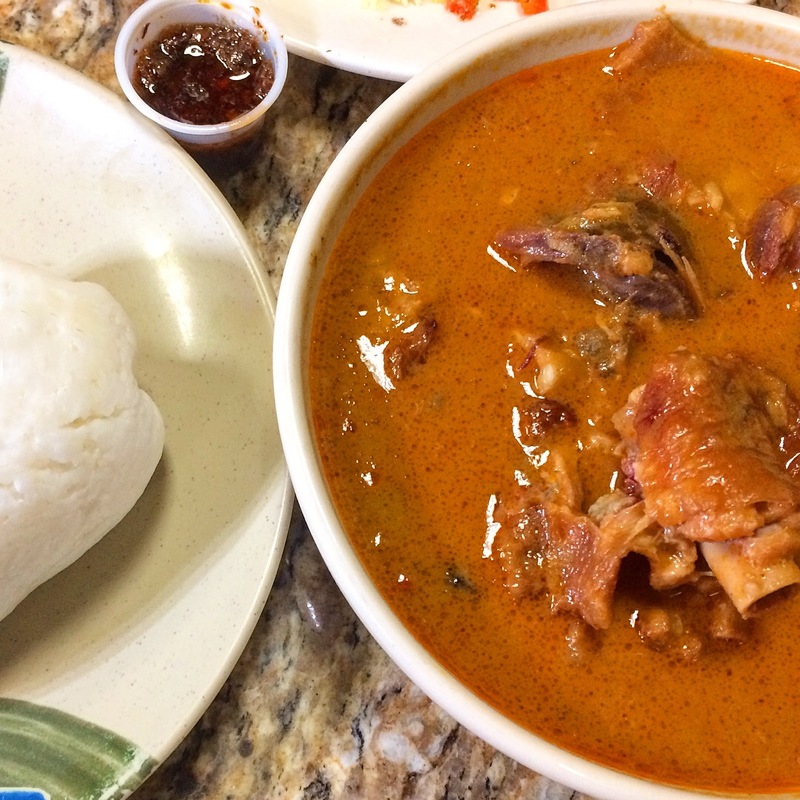 All of the above are incomplete without some kind of fufu; that’s what turns these sauces, soups and stews into a meal. 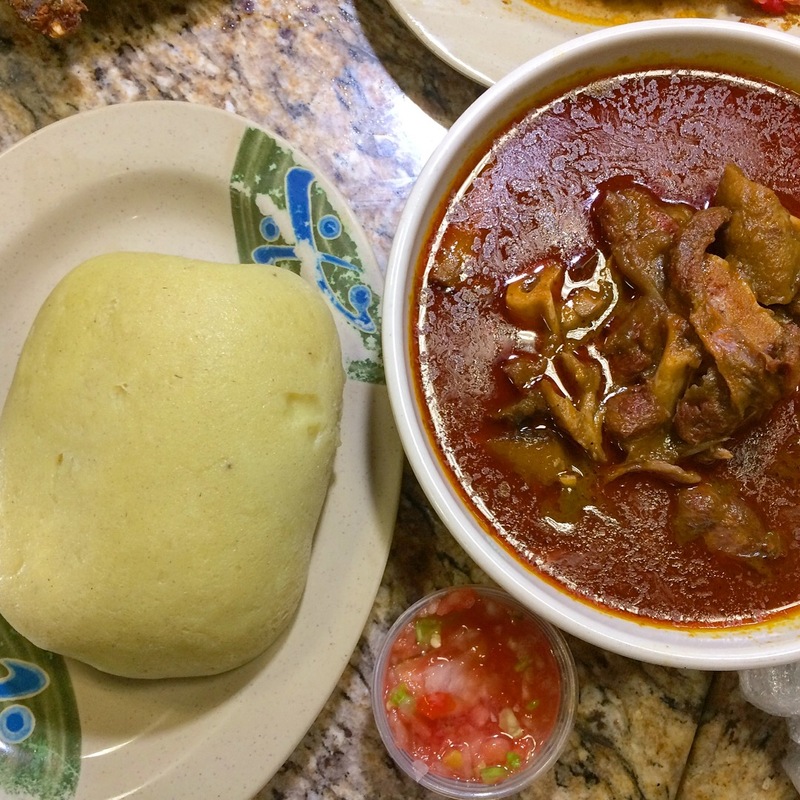 As with all West African doughy starches, you pinch off a bit, dip it into the delectable soup or sauce, and enjoy – really hands-on cuisine! From the bottom moving clockwise, here are omo tuo, banku and corn fufu. 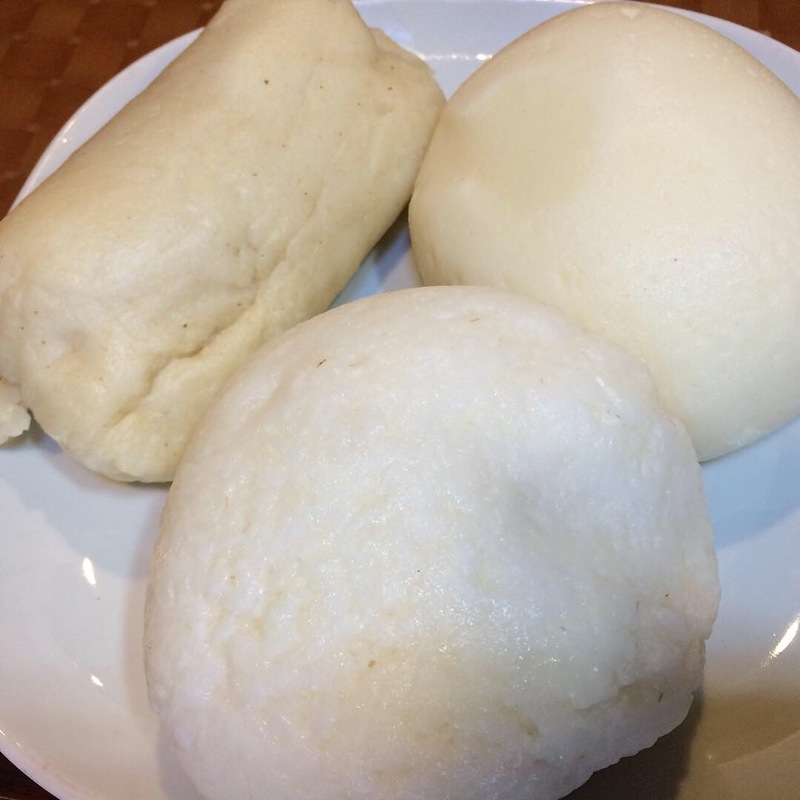 Omo tuo is made from rice cooked with more than the usual amount of water; that technique produces softer grains which are then pounded and shaped into a ball. It works particularly well with peanut stew or soup. Banku is a fermented variety made from cassava sometimes blended with corn; we paired it with the egusi soup. The corn fufu worked well coupled with the tomato sauce with chicken and beef. Black eyed peas and plantains, no explanation needed, but so good! 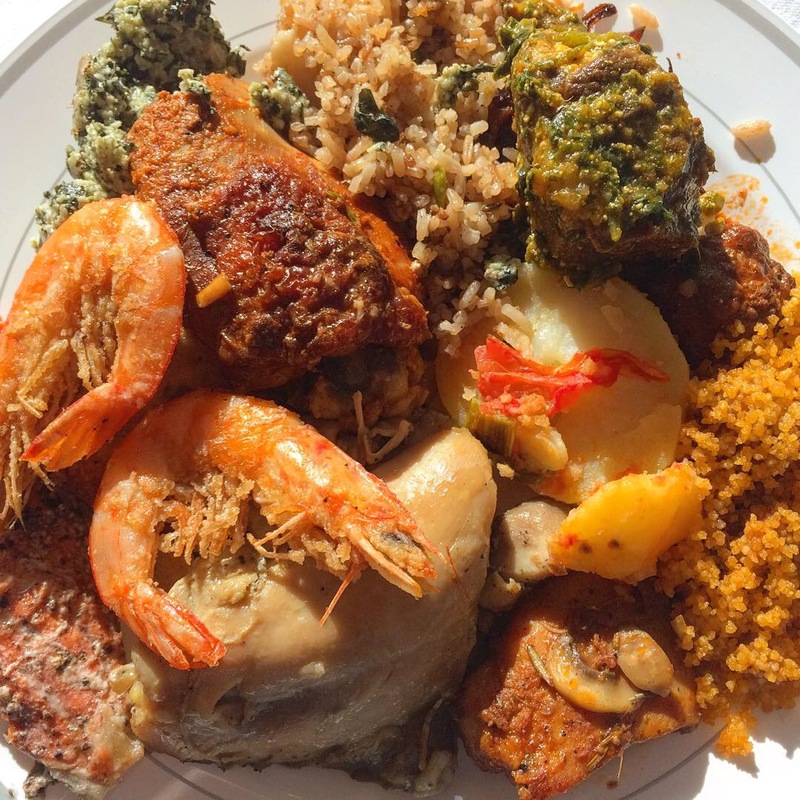 I admit to being a major fan of West African food; it differs from nation to nation so if you haven’t tried any yet, there’s plenty to keep you busy in every borough of New York City. Keep following my posts to see more! One more photo from another amazing dinner at Accra Restaurant, 2065 Adam Clayton Powell Jr Blvd in Harlem. 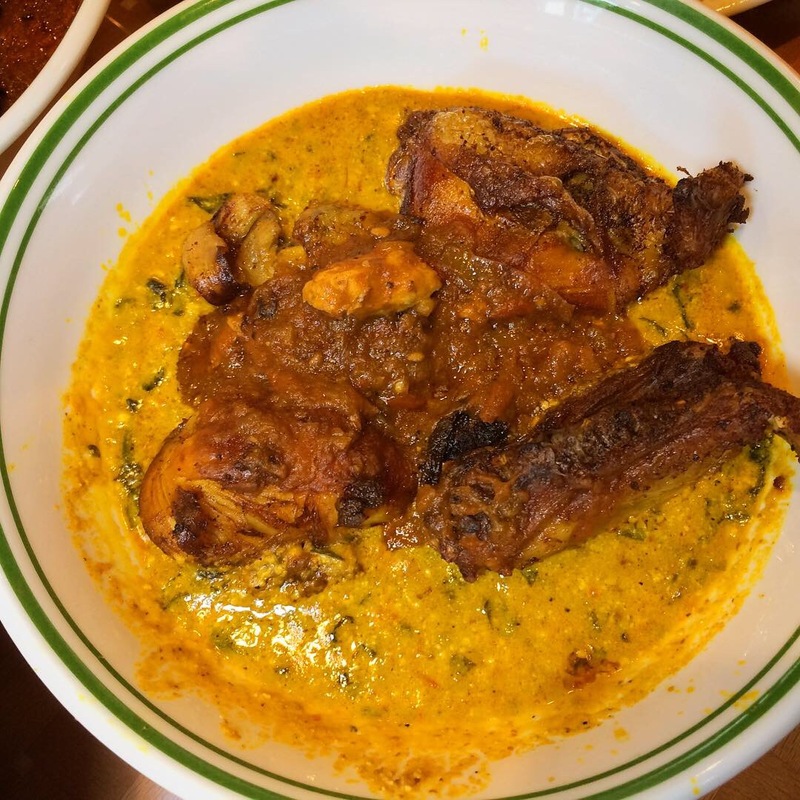 The last time we went, Ayesha, the owner, told me that this dish was new on the menu and recommended that we try it. I am so glad we did! Yam Porridge (aka asaro). Not what some customarily think of as porridge, and not the kind of yams some think of as Thanksgiving fare (those are actually sweet potatoes), these yams are seasoned and cooked down so there is a little mashed yam “soup” and some larger tender chunks. Topped with a sauce made from smoked turkey, onion, and tomato in red palm oil, it was another winner. If this isn’t comfort food, I don’t know what is! PS: Get some of their amazing homemade ginger beer when you go! Non-carbonated, non-alcoholic, unique and delicious. 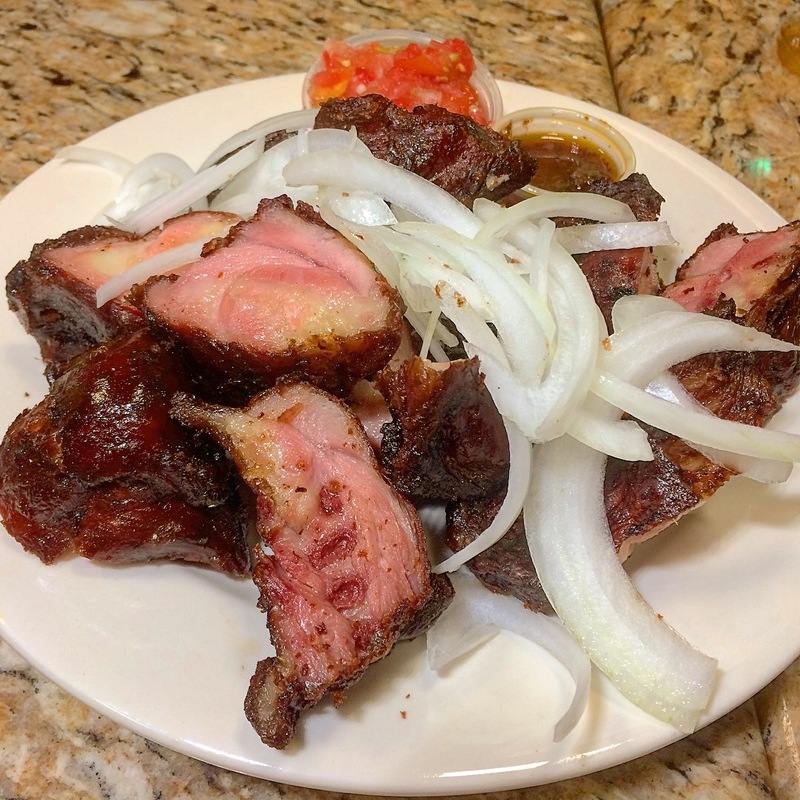 The last photoset from our recent amazing dinner at Accra Restaurant, 2065 Adam Clayton Powell Jr Blvd in Harlem – until I go back for more, that is! Jollof Rice with Chicken. And a hard-boiled egg. 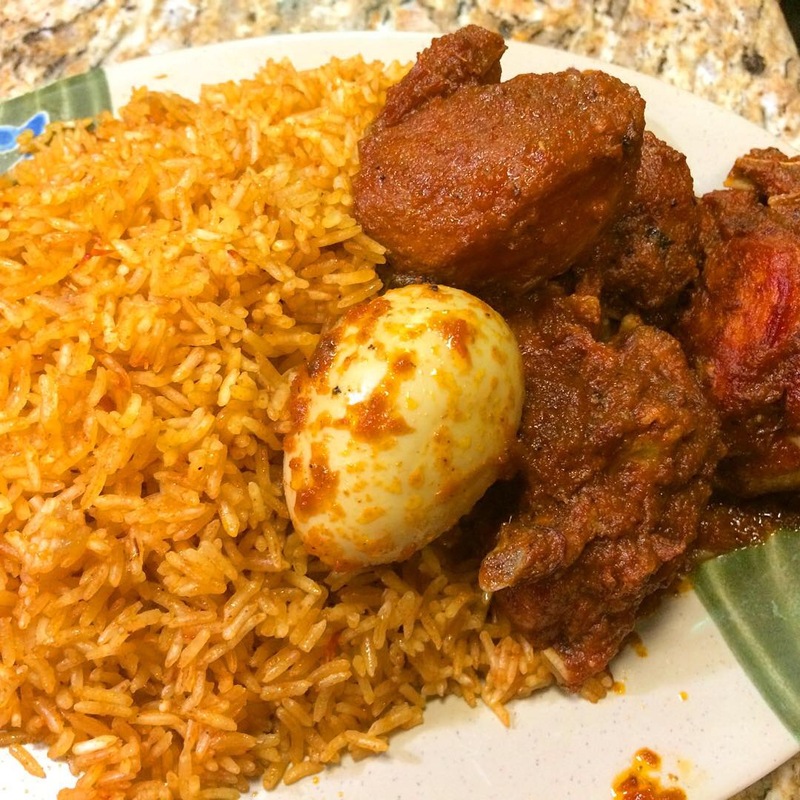 Accra’s jollof rice, the widely celebrated and beloved tomato-based West African triumph and a source of both pride and dispute among African nations as to whose version is best, was delicious as was the chicken. Pounded Yam Fufu and Okra. This time, the fufu is yam rather than cassava; different but equally tasty. The okra soup is delicious although mucilaginous – an acquired taste, or perhaps an acquired texture. Generally my advice to those who are new to okra soup is to try to think past the consistency and just focus on the wonderful flavor! Wakey (you might see waakye) with Fried Whiting and Gari. 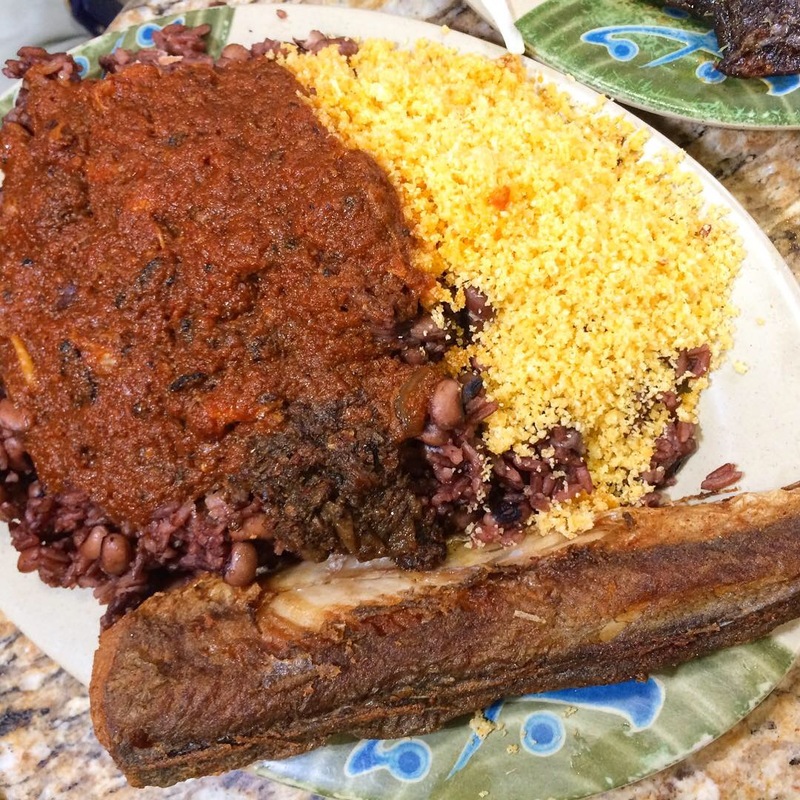 Waakye is Ghana’s culinary claim to fame; similar to West Indian rice and peas, it’s made with rice and black eyed peas or cowpeas. Gari is dried, ground cassava, a little like Brazilian manioc, but unique. And tasty fried whiting – what’s not to like?! I’ll post the detailed story about our incredible experience as well as a roundup of everything we ate soon. But wait! There’s more! More photos from our recent incredible dinner at Accra Restaurant, 2065 Adam Clayton Powell Jr Blvd in Harlem, that is. Continuing the cavalcade of food we loved…. 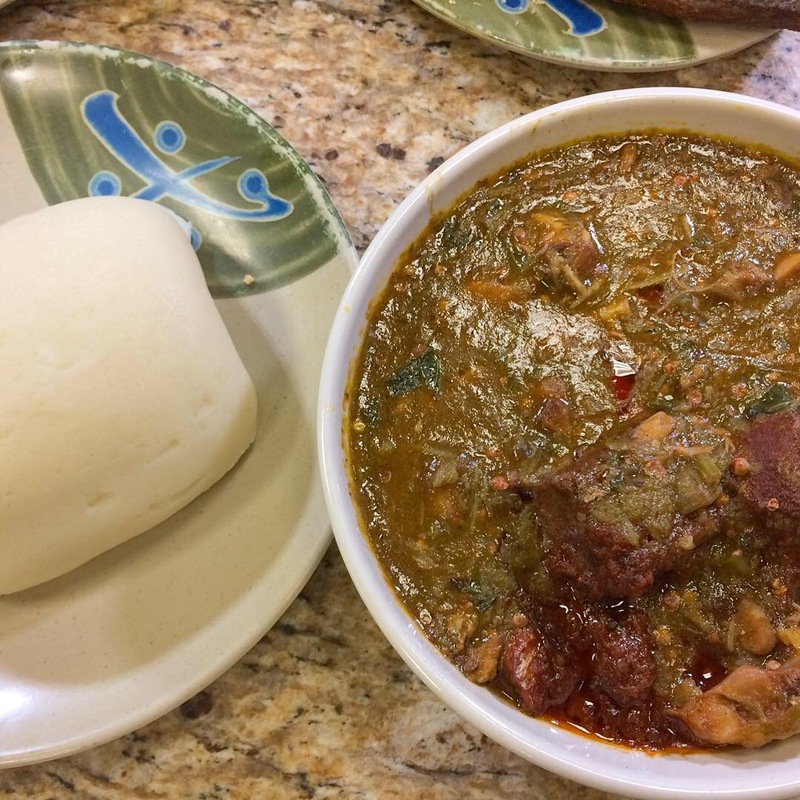 Eba with Egushi. So many fufus, so little time, and I admit to liking them all. 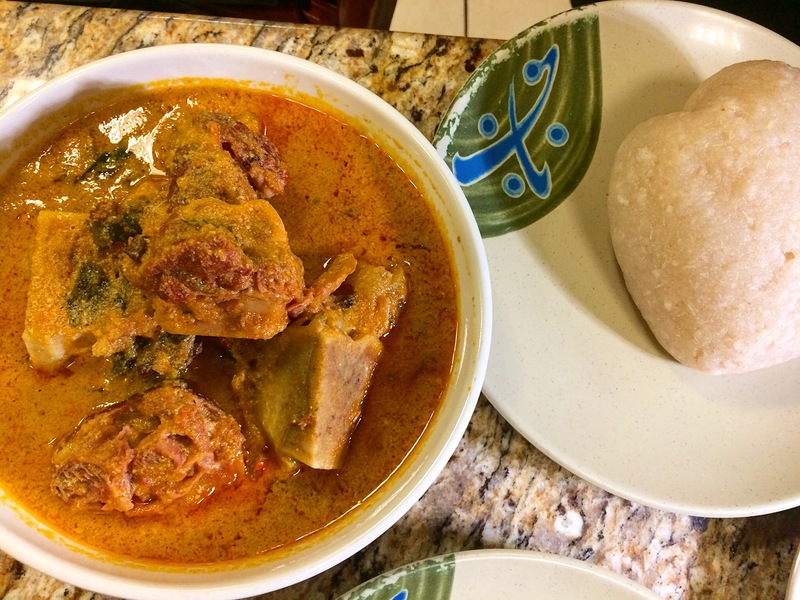 In contrast to smooth, pounded cassava fufu, firmer eba has tiny flecks of gari (dried grated cassava) in it and is a little tart or sour tasting. Perfect with egushi (you might see egusi), a delicious soup made from ground melon/pumpkin/squash/gourd seeds. 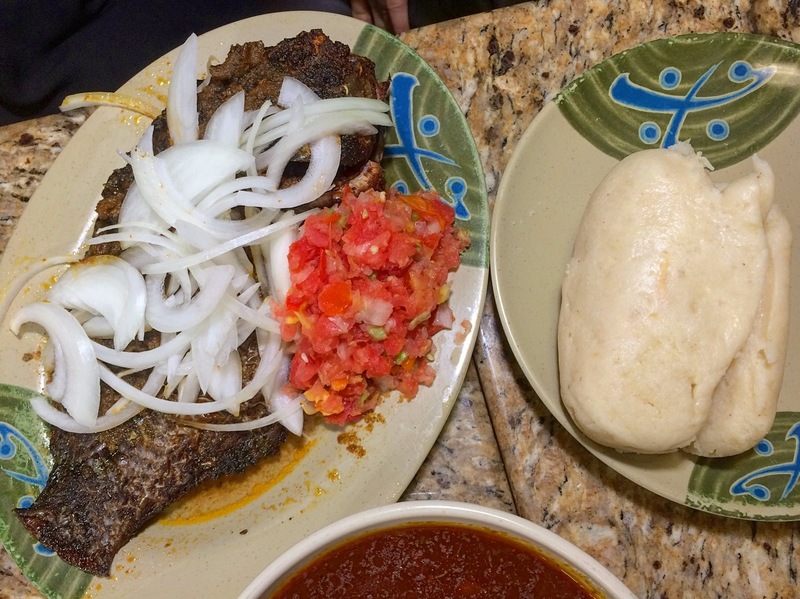 Banku with Baked Tilapia. Banku is fermented corn or corn + cassava dough, a little sticky, and is a typical partner for baked tilapia and other fish dishes. 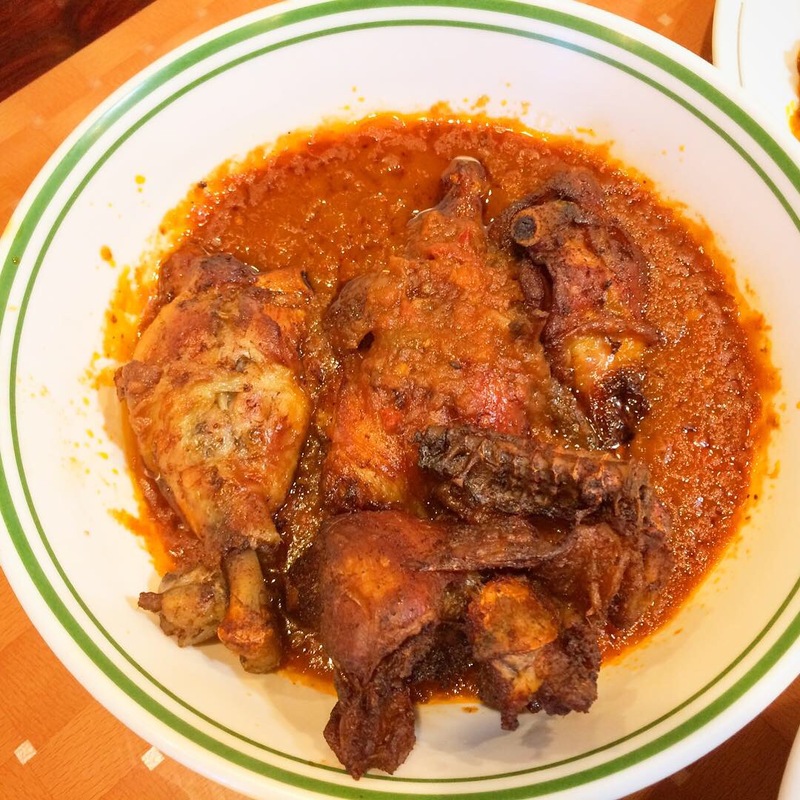 More to come from Accra Restaurant…. 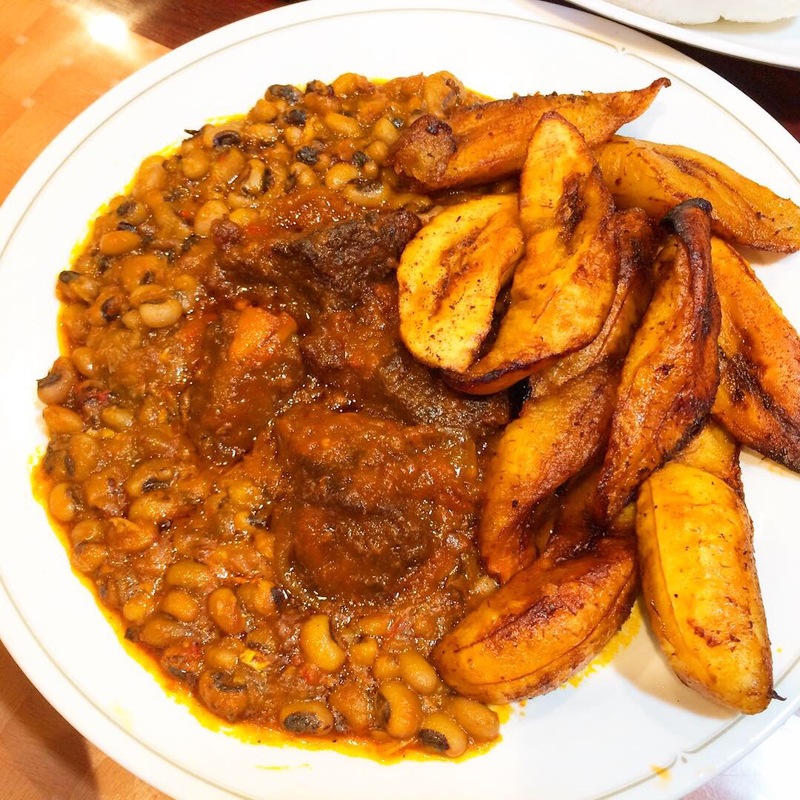 Our recent off the charts dinner at Accra Restaurant, 2065 Adam Clayton Powell Jr Blvd in Harlem featured so many delicious dishes that I don’t have a favorite, other to say how much I love the cuisine of Ghana and the way Accra does it. I’ll do a comprehensive post soon, but meanwhile here are few more photos of what we enjoyed. Dibi and Acheke with remarkable mustard onions. 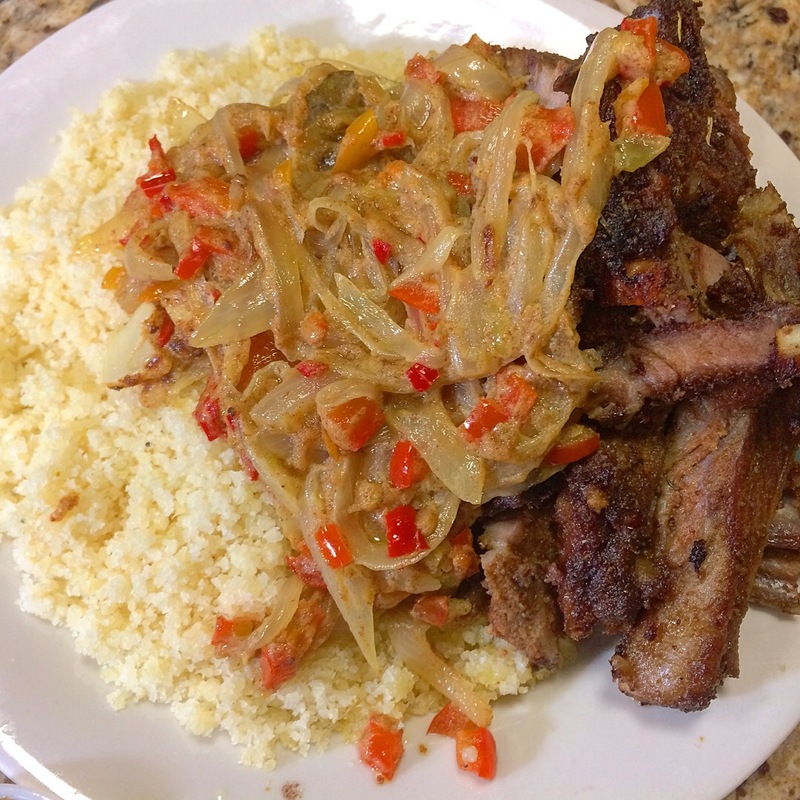 Dibi is roasted meat, in this case lamb, sliced into chunks, and often part of the street food scene; the mustard component is a significant ingredient in the recipe. 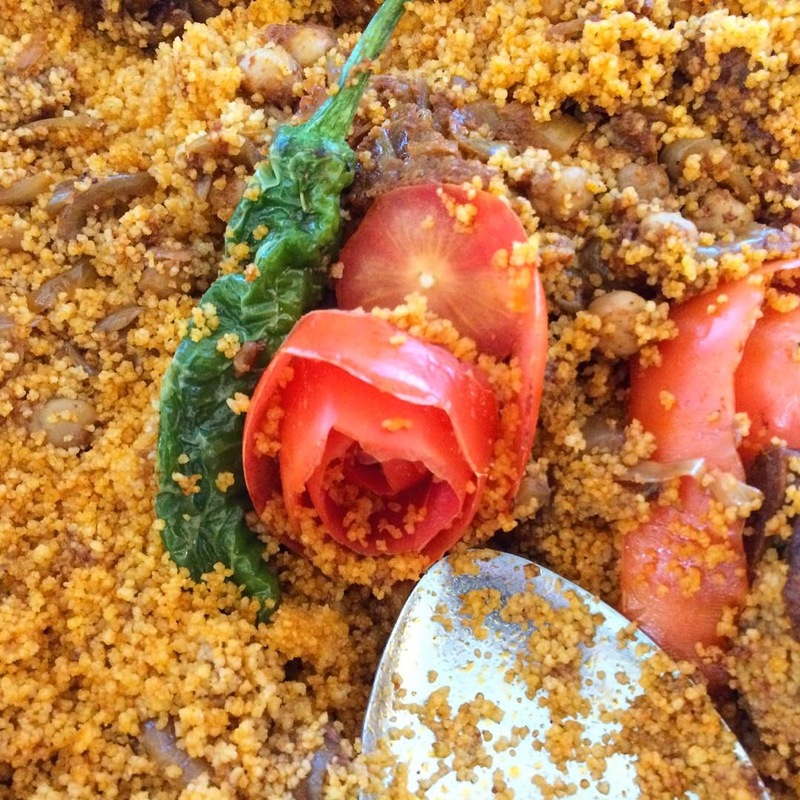 Acheke (you might see it as attiéké) is grated cassava with a texture similar to couscous. Guinea Fowl (Akonfem). The meat is a little leaner than chicken and the flavor is more pronounced. It was topped with peanut powder, traditionally a blend of peanuts and chili powder along with spices like ginger, nutmeg, cloves, and cinnamon. More to come from Accra…. 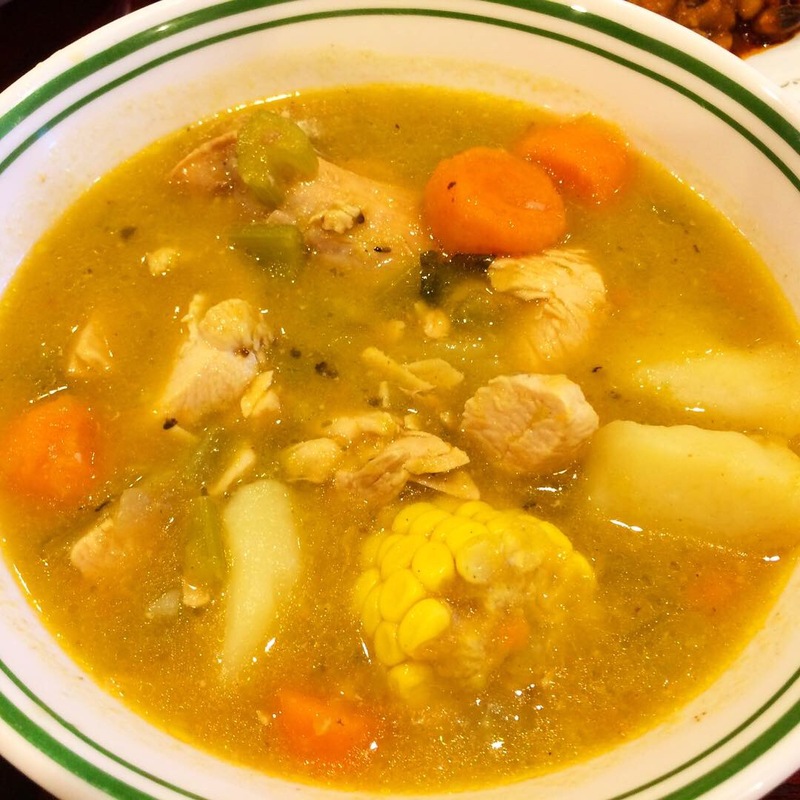 More deliciousness from our recent feast at Accra Restaurant, 2065 Adam Clayton Powell Jr Blvd in Harlem. Full story coming soon, but for now a few more photos of what we enjoyed. Emo-Tuwoo and Peanut Soup with goat. I’ve seen many spellings for this starch including emotuo and omotuo; orthography aside, it’s a compressed rice ball that goes perfectly with peanut soup. Sounds good, right? Tasted even better! 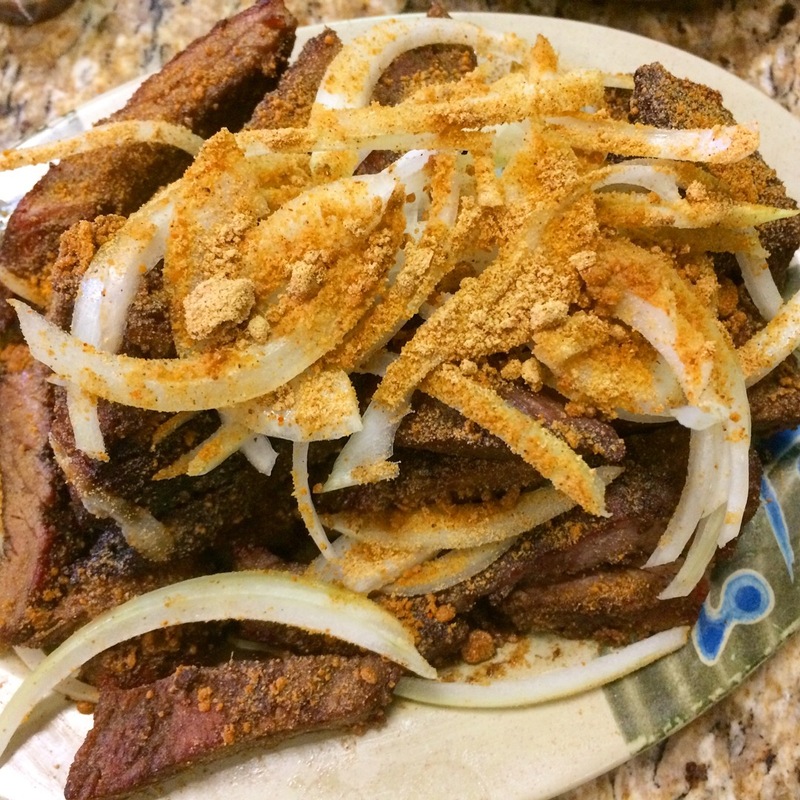 Ever had Ghanaian cuisine? Want to try some of the best you’ll ever have? 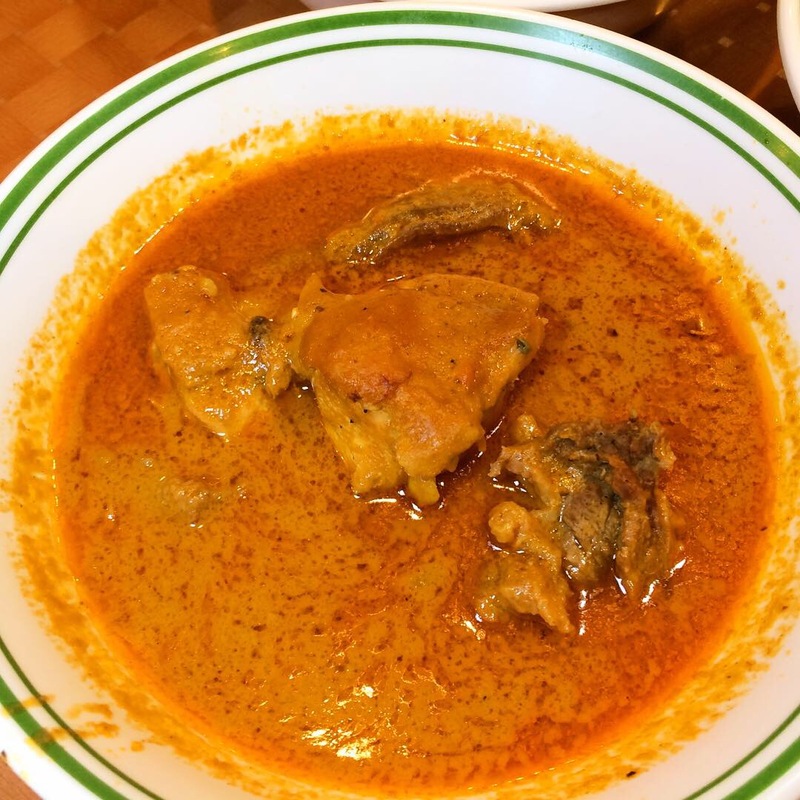 Then look no further than Accra Restaurant, 2065 Adam Clayton Powell Jr Blvd in Harlem. A group of us converged there recently and thanks to their excellent food and warm hospitality, it was an extraordinary experience. The tale is the stuff of which fantasies are made and I’ll post a detailed story soon but in the meantime, I’ll feature some dishes to whet your appetite. Plantain Fufu and Palmnut Soup. Pinch off a hunk of the starch with your fingers, dip it in the delectable soup and enjoy. One of my favorite starch/soup combinations, but they’re all great here. Suya. Grilled, spicy skewered beef (sliced here), best known as a delicious street food. 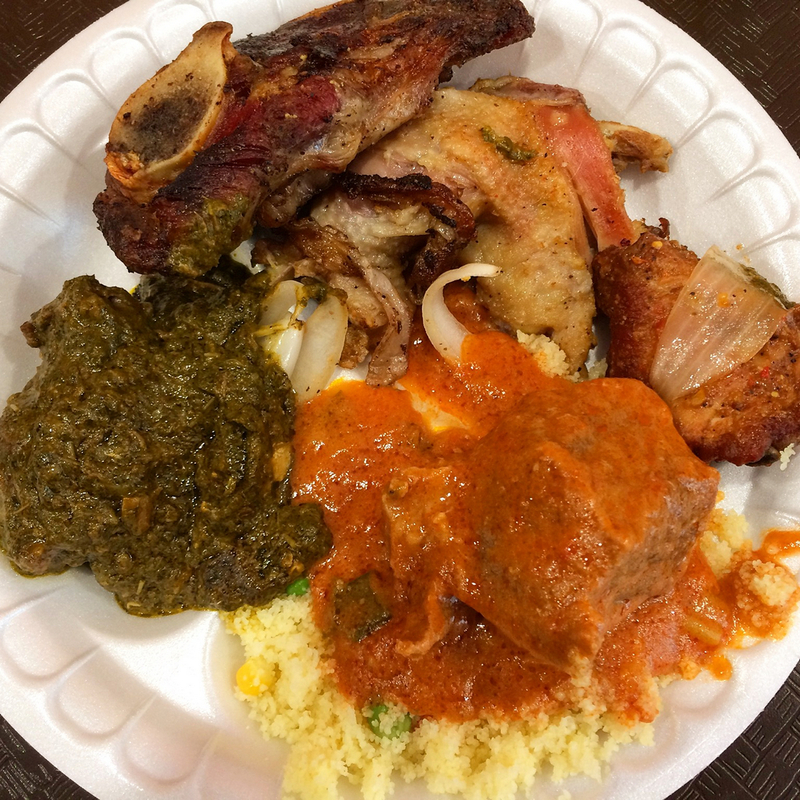 Golody Halal Buffet recently opened at 222 1st Avenue in Manhattan. Featuring West African and Mediterranean cuisine, it’s steam table, self-serve style and their descriptions of what I selected were simple: “Lamb Chops, Chicken, Spicy Chicken, Athieke with Peanut Butter Sauce, Cassava Leaves”. Timing is everything and ours was less than stellar; we were told to come back in two hours and there would be more choices. Ah well, maybe another day. Note that although the signage reads “All You Can Eat”, it’s pay by the pound. Scenes from the Allerton Avenue International Food Festival in the Bronx. 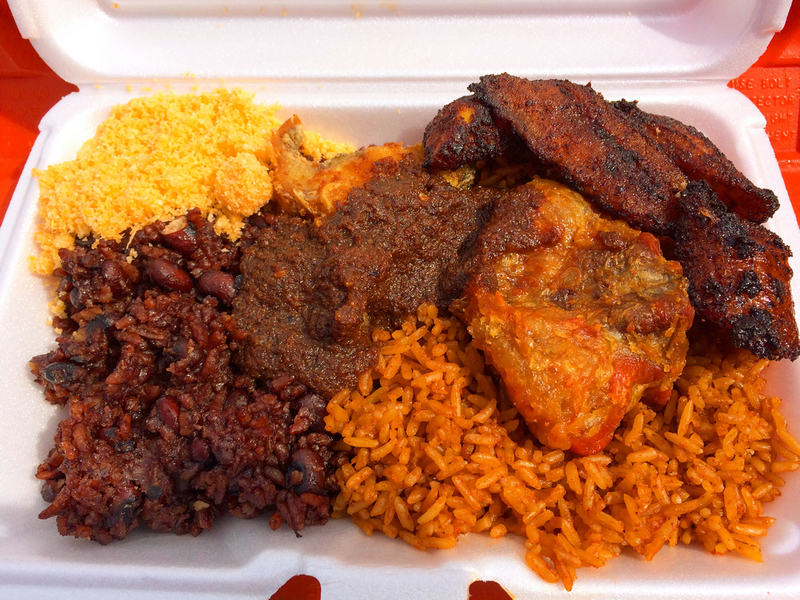 Waakye – you may see variant spellings but the pronunciation is wah-chay (rhymes with watch-way) and it’s Ghana’s culinary claim to fame. Similar to West Indian rice and peas, it’s made with rice and black eyed peas or cowpeas; the characteristic reddish-purplish-brown color can come from dried red sorghum leaves, millet leaves, or even baking soda. 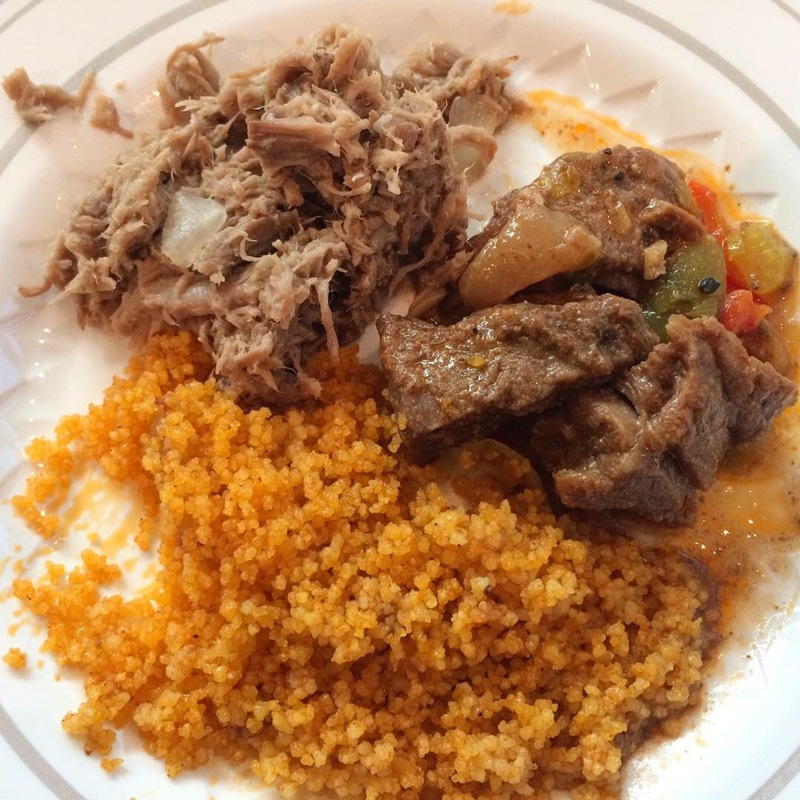 Yellow gari (ground cassava) on the side. Jollof rice – There’s a keen rivalry among West African countries over whose version is the best but tomato paste figures heavily into all of them. 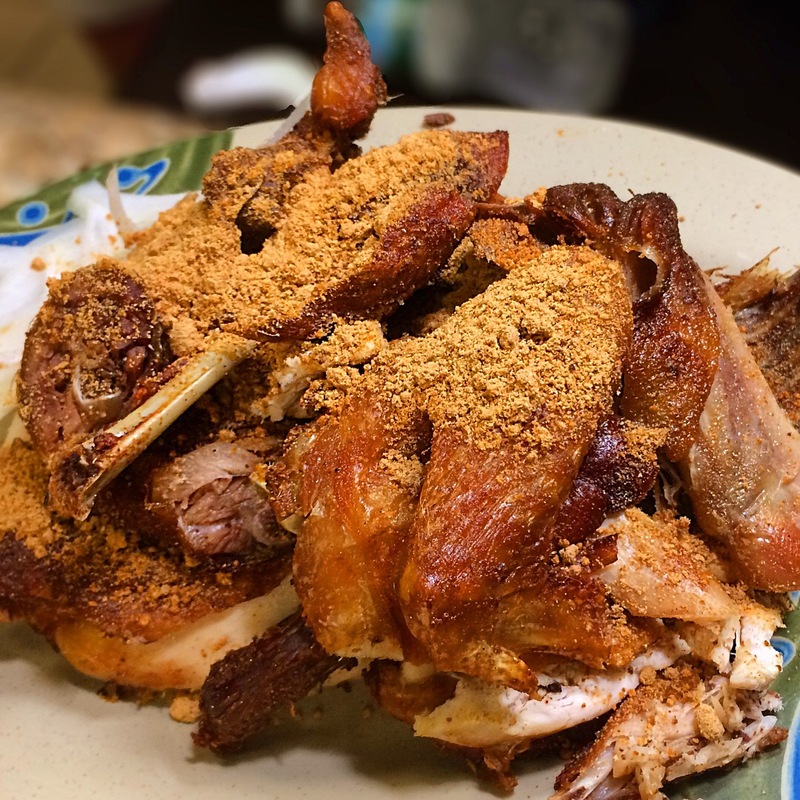 Fried turkey (the part that goes over the fence last – yum! 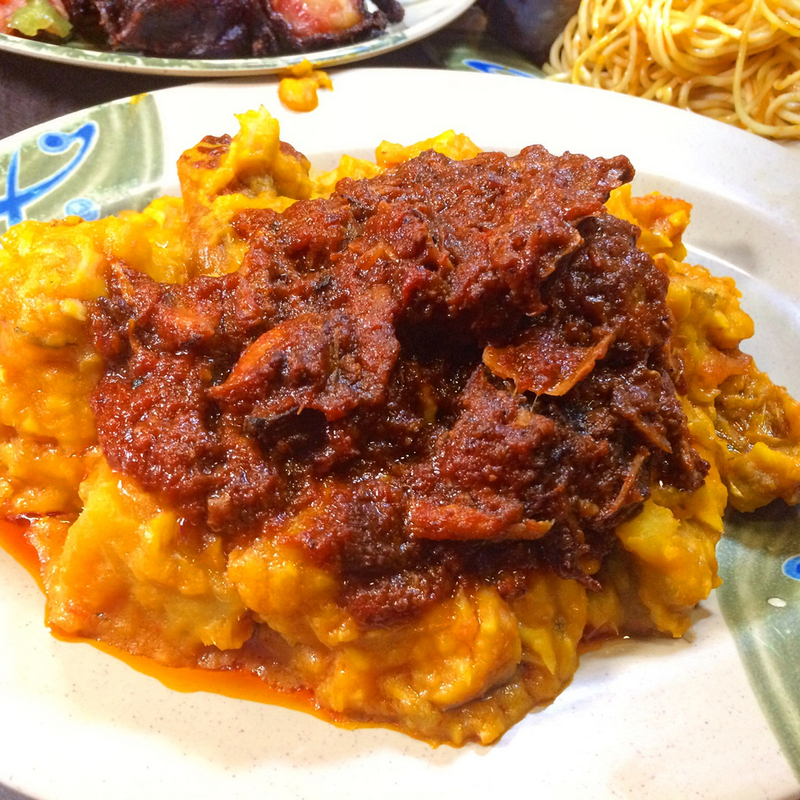 ), plantain, and fried croaker submerged under spicy sauce.